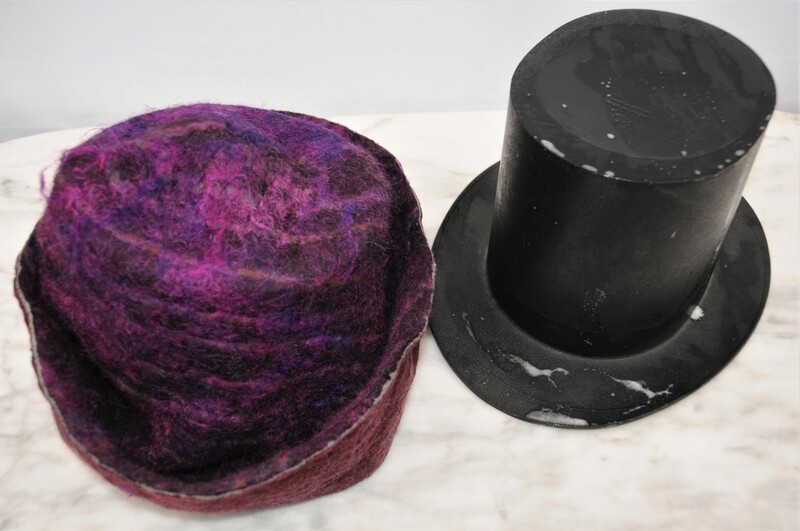 A vintage Moët and Chandon top hat ice bucket provided the inspiration for this wet-felting tutorial. The ice bucket was purchased from a local car boot sale for £10, but yours could be bought from e-Bay for as little as £20. 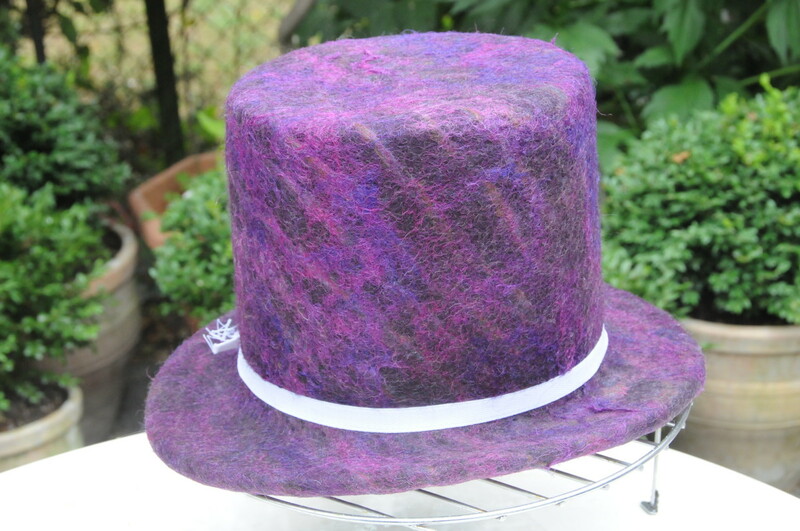 This is a far cheaper alternative to vintage millinery hat blocks, which can command high prices, often in the region of £150. 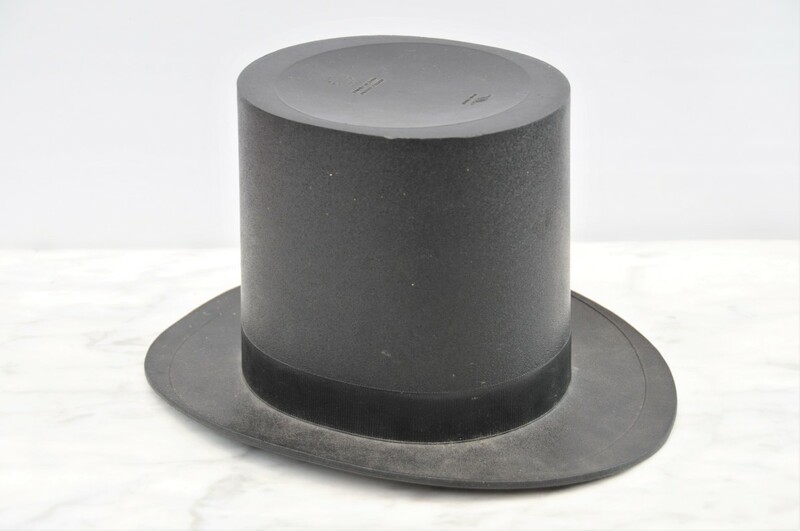 Top hats blocks are rare and even more expensive. 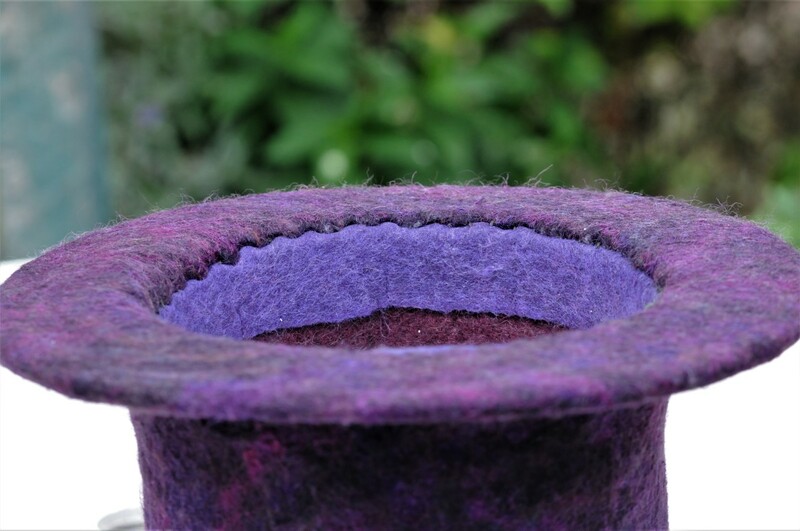 Hat blocks come in various shapes and sizes but it is not often that one finds an ice bucket with a gorgeous shape that can be utilized in hat-making! 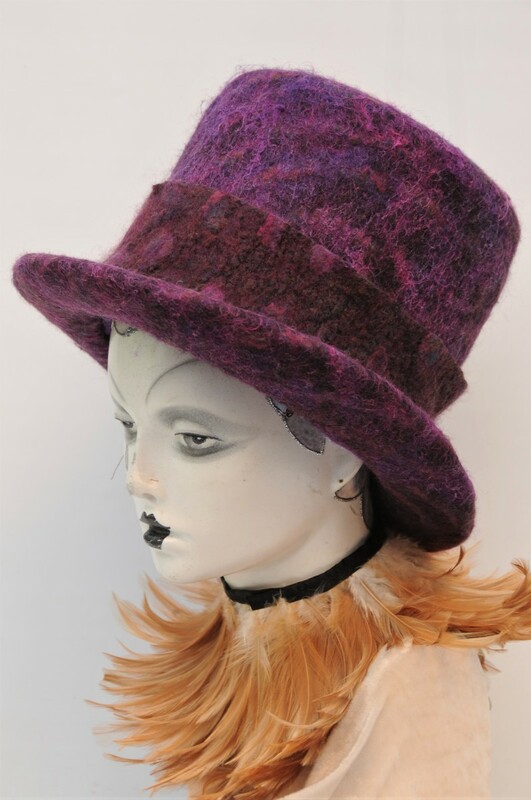 The double hat band, though not planned, simply evolved during the felt-making process. The end result surpassed all expectations. 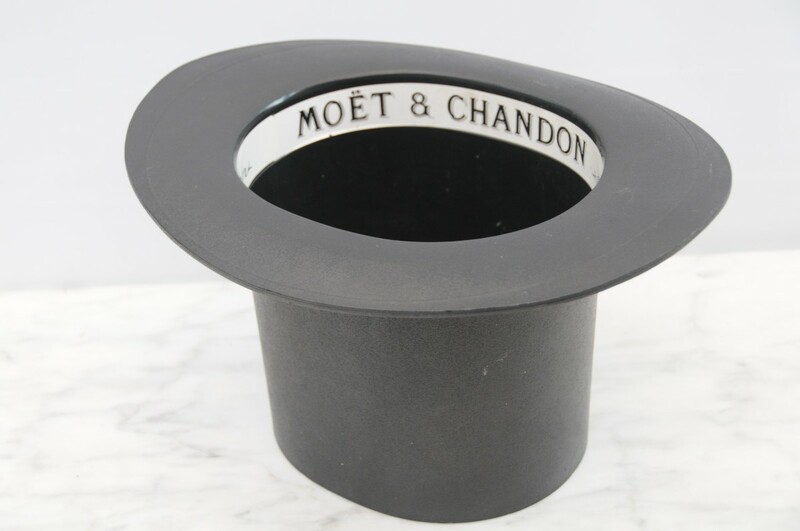 Vintage top hat-shaped Moët and Chandon ice bucket. 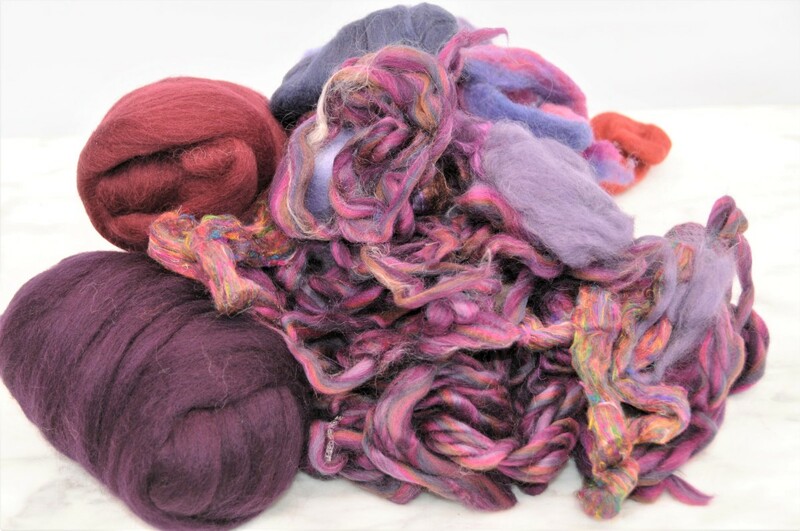 Pencil roving or silk embellishment for embellishment if desired. 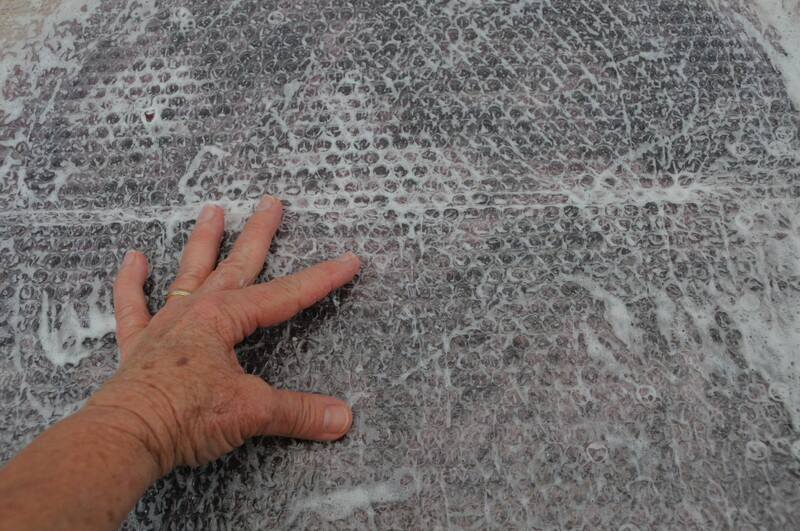 A sheet of foam underfloor layment on which the template can be drawn. Underfloor layment is the perfect choice for this template because it can be re-used many times over. Felt-tip pen: This is for drawing the template. 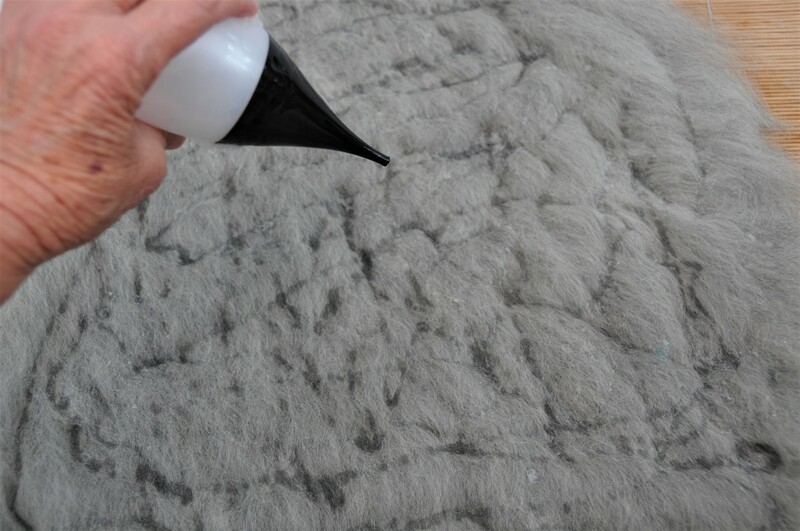 Use a damp cloth to remove any traces of ink left behind from the felt tip pen so that it does not bleed into the wool. 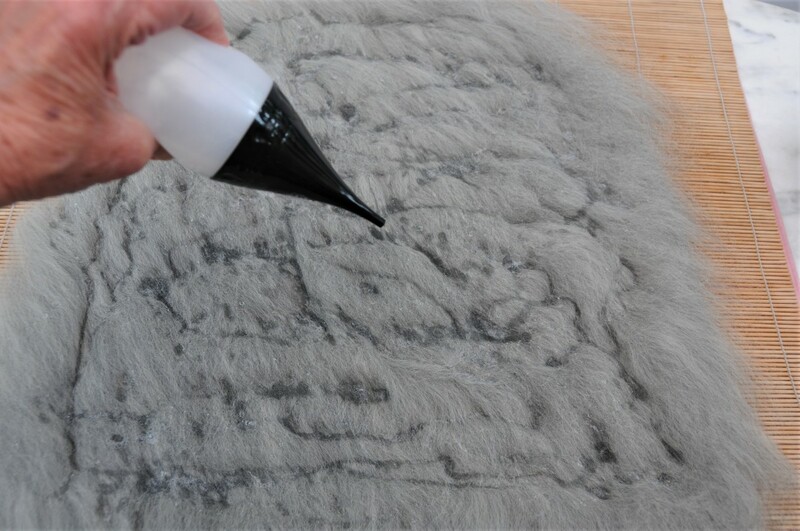 Draw and cut out the Template as shown below onto a sheet of underfloor Layment using a felt-tip pen. 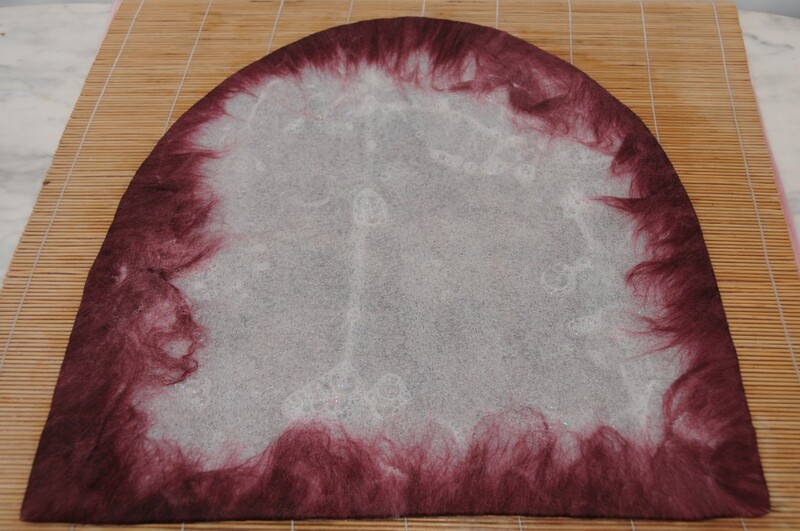 Use a damp cloth to remove any felt-tip markings on the template so that these do not bleed into the wool. 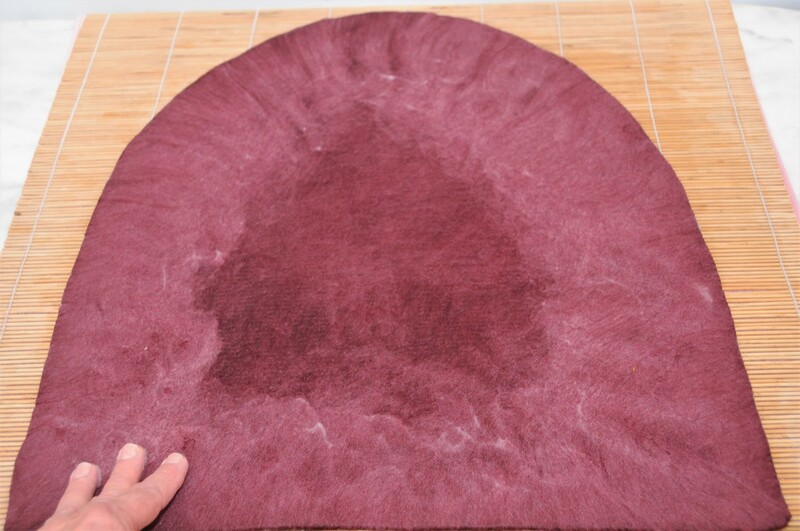 Place an old towel down onto a waterproof surface. Put a large heavy duty bamboo blind down onto the towel. 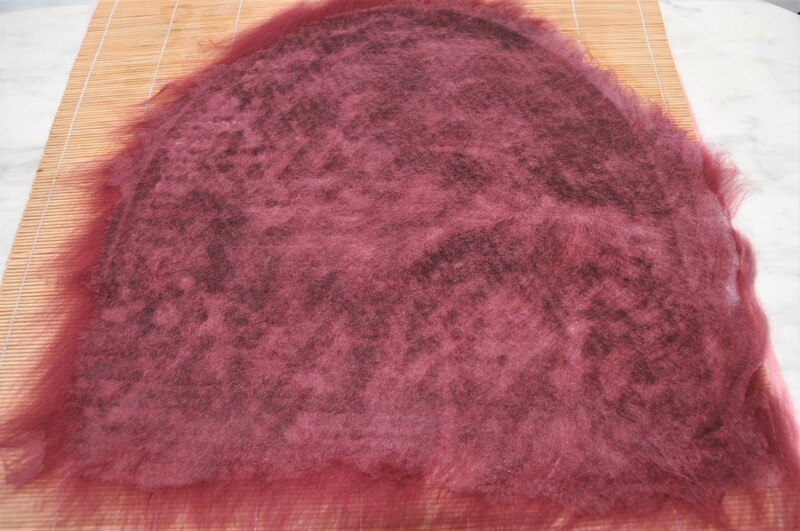 Put down an even layer of Merino Wool fibers as shown on the template below. 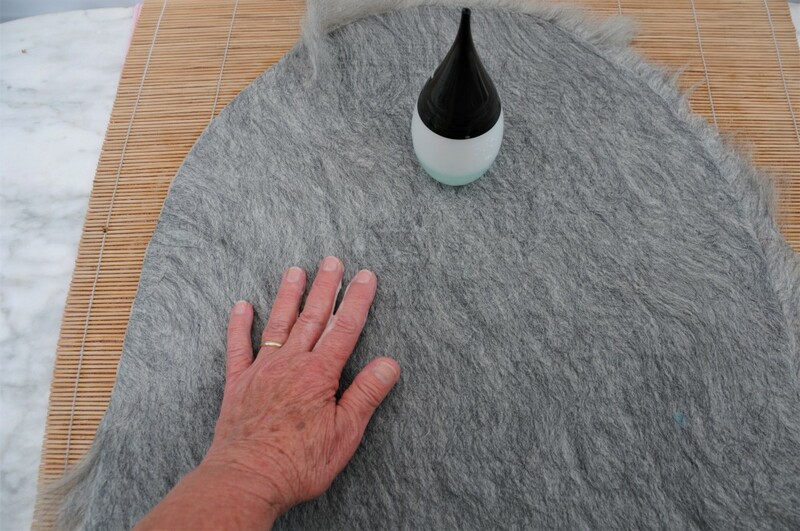 Sprinkle the project using warm soapy water in a squeeze bottle. 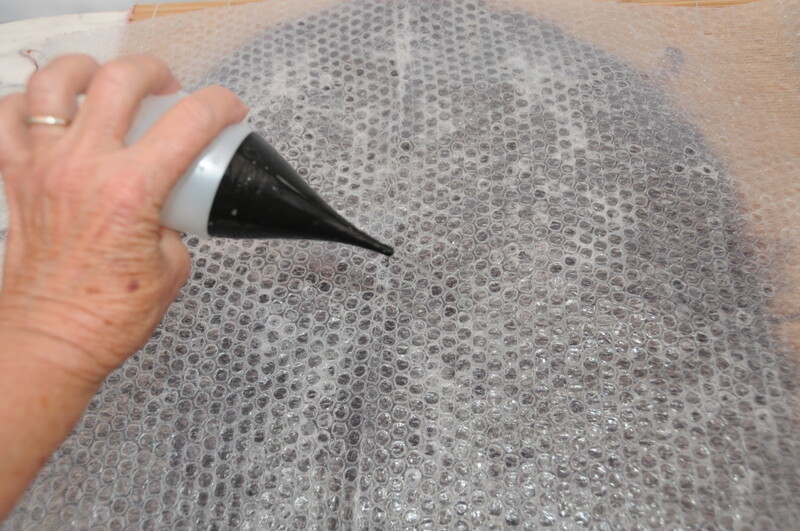 Wet the surface of the bubble wrap to facilitate easy movement of the fingers when rubbing the surface. 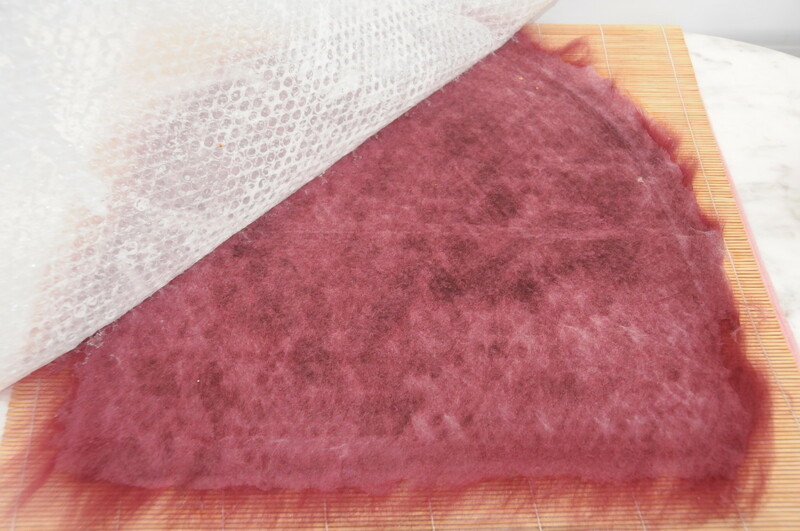 Gently lift the bubble wrap from the wool without displacing the fibers below. 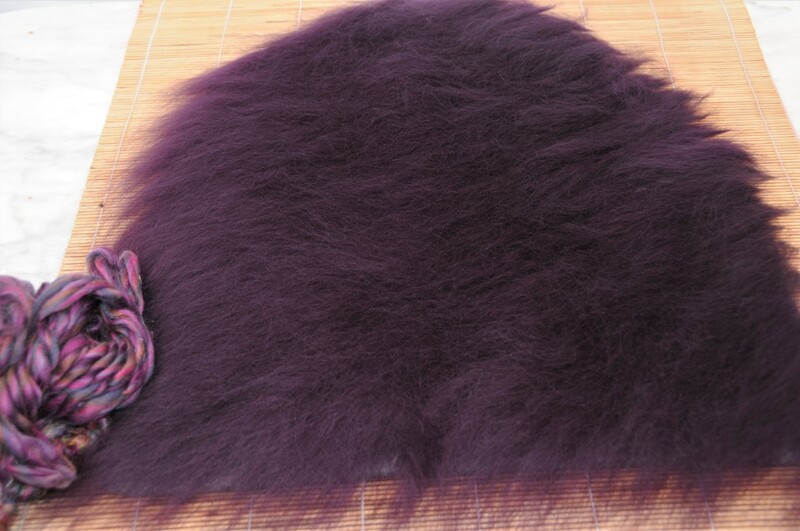 Prepare to neaten the edges around the template. 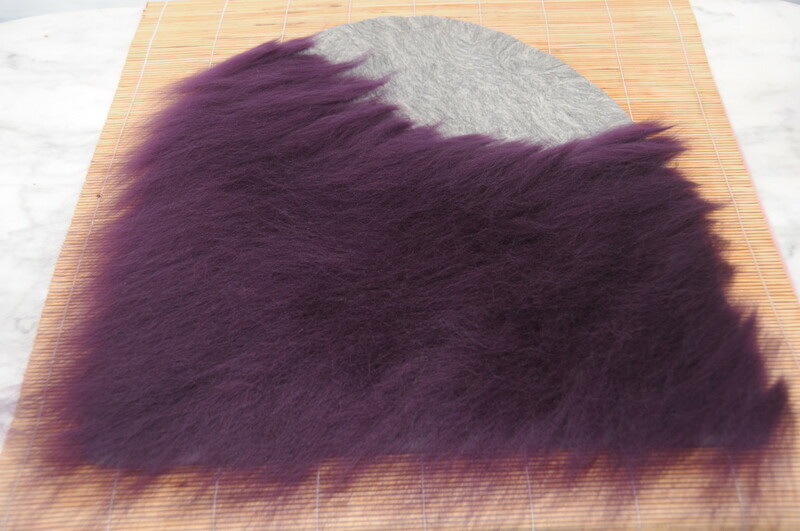 Fold the loose fibers over the edges of the template. 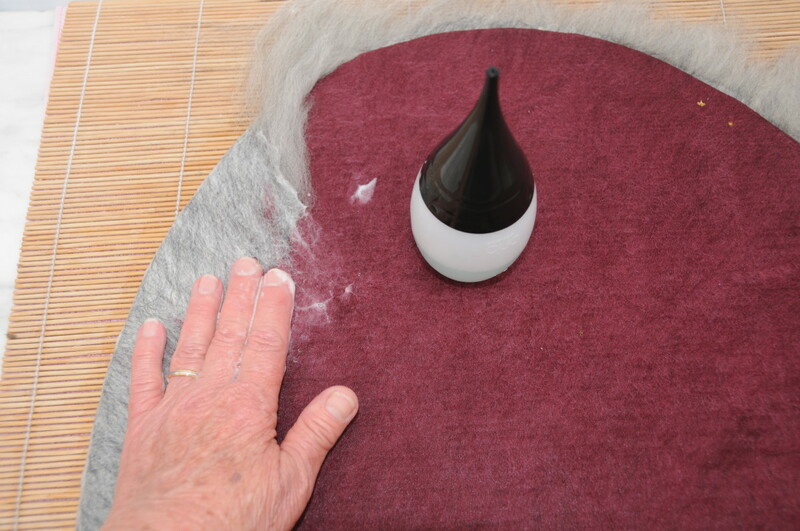 Use your fingers and a little warm soapy water as needed. 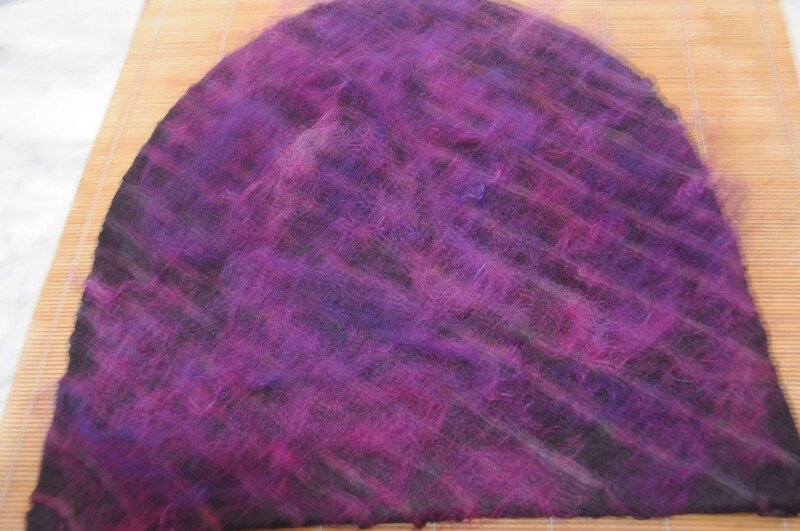 Cover the 2nd side with an even layer of Merino Wool Roving. Wet side 2 of Layer 1 with warm soapy water and cover the project with a sheet of bubble wrap. 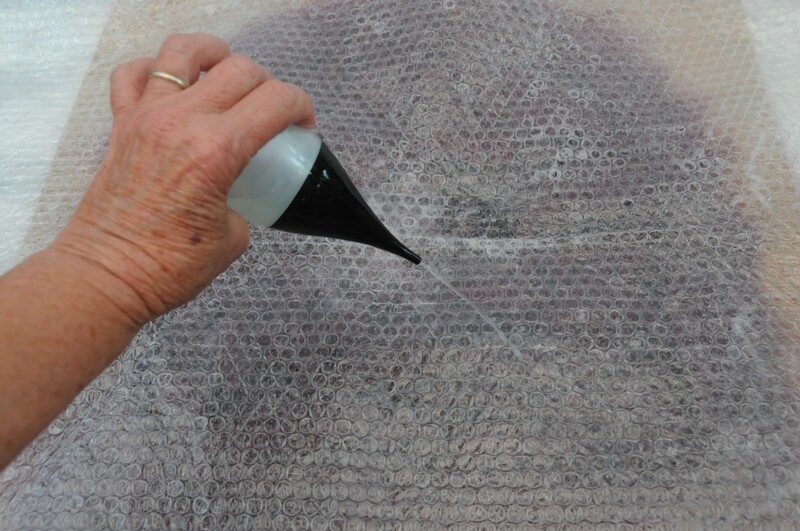 Sprinkle warm soapy water onto the surface of the bubble wrap. 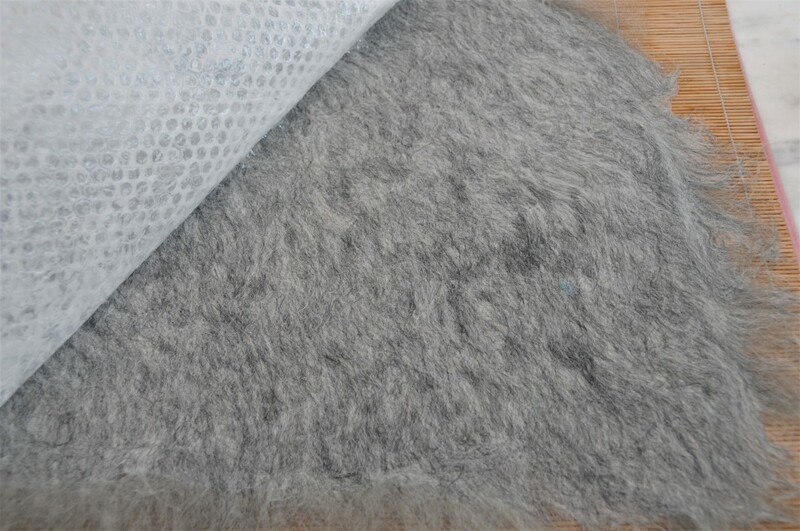 Rub well and remove the bubble wrap from the flattened wool. 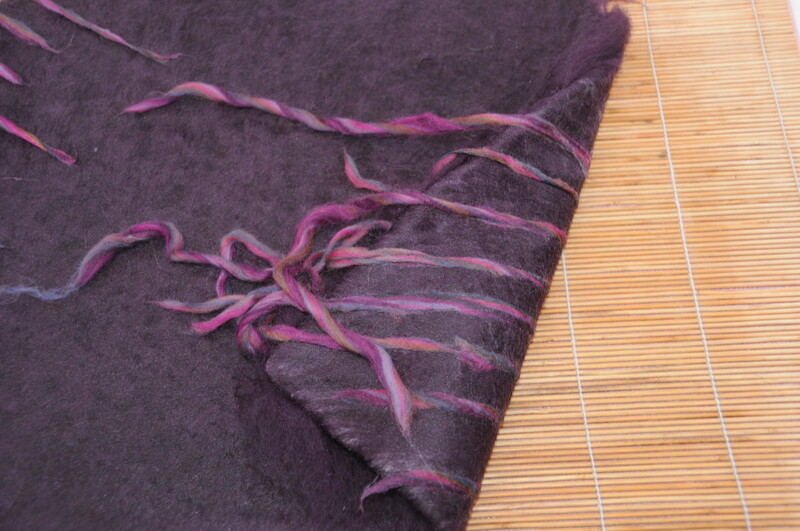 Fold over any loose wool on the edges. 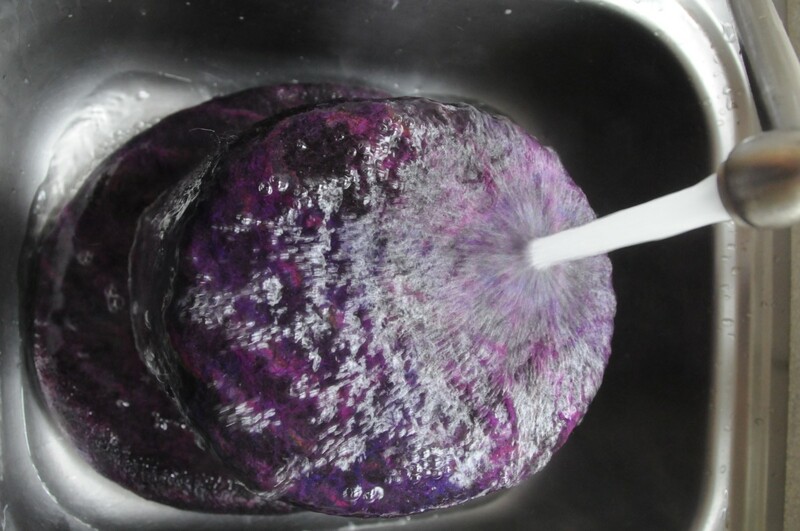 Use your fingers and a little soapy water. Grey has been used here to help you differentiate the Layers from one another but you may use any color you prefer. Sprinkle soapy water onto side 1 of Layer 2. Sprinkle the bubble wrap with warm soapy water. 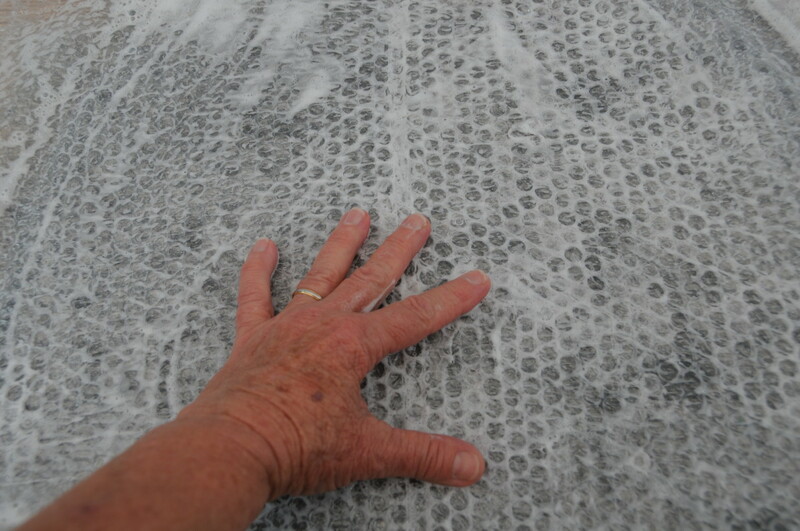 Press down on the surface of the bubble wrap. Force the water down and out towards the edges of the template. 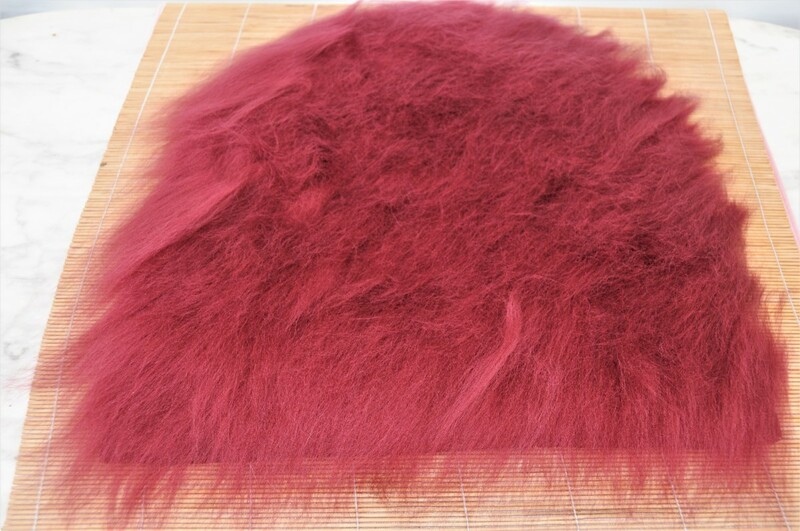 Rub until the fibers have completely flattened. 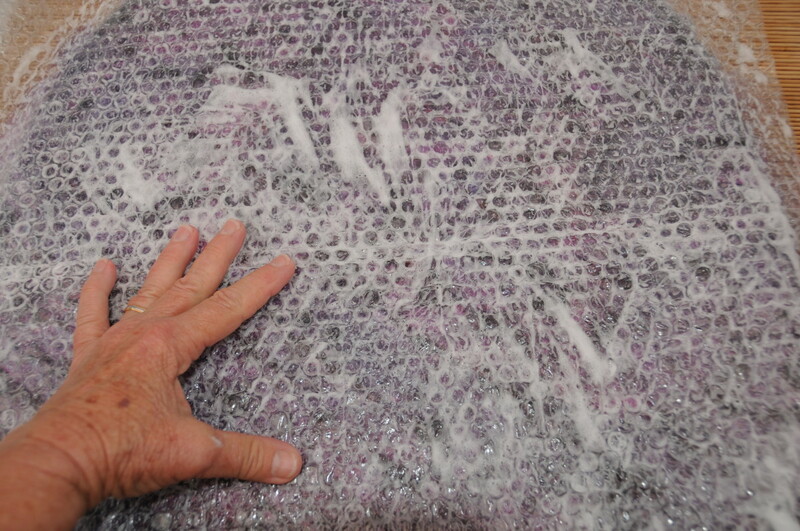 Lift off the bubble wrap to reveal the flattened wet fibers. 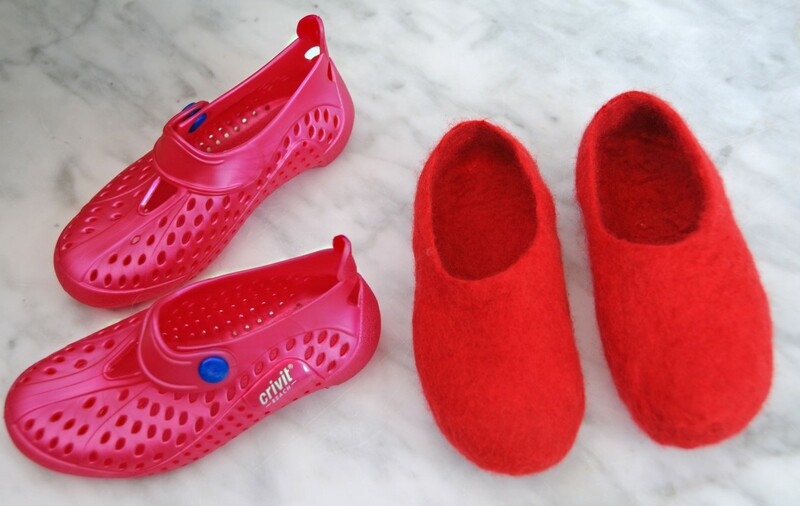 Prepare to neaten the wool on the edges. 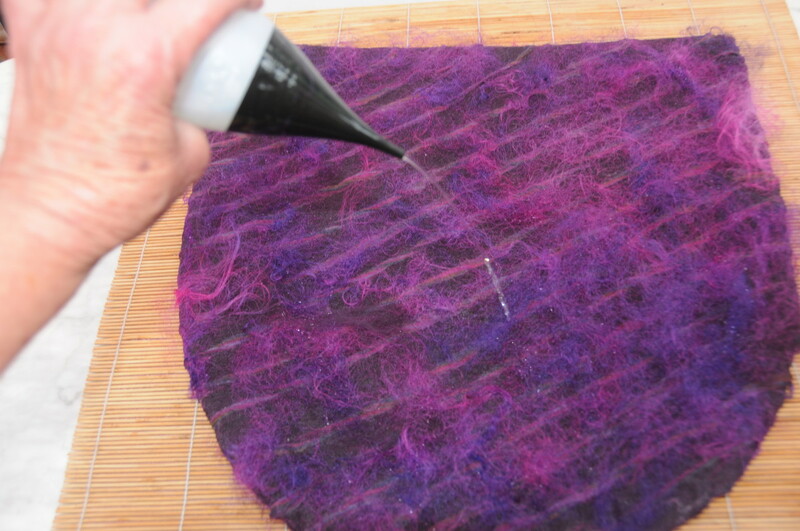 Sprinkle soapy water onto the fibers. 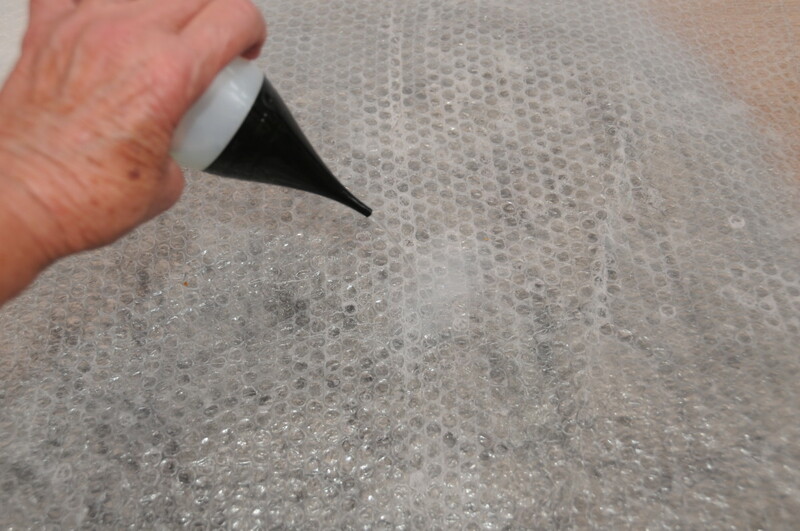 Wet the bubble wrap with warm soapy water. 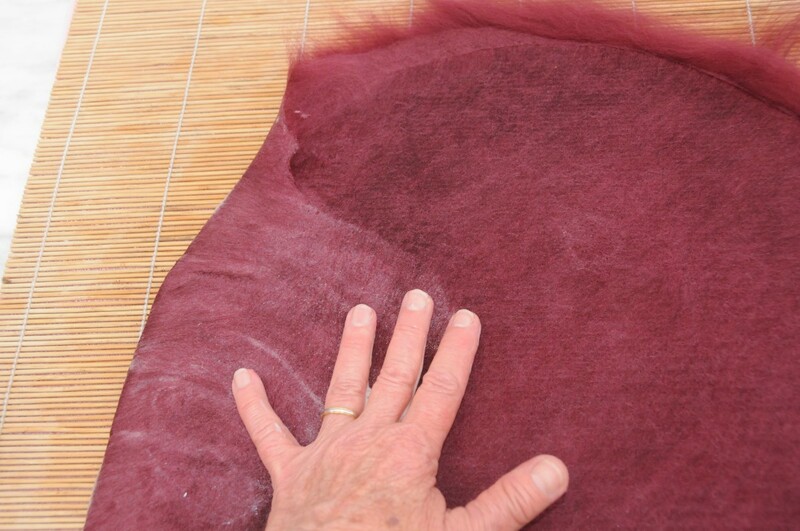 Rub until the fibers become flat under the bubble wrap. Gently lift off the bubble wrap. 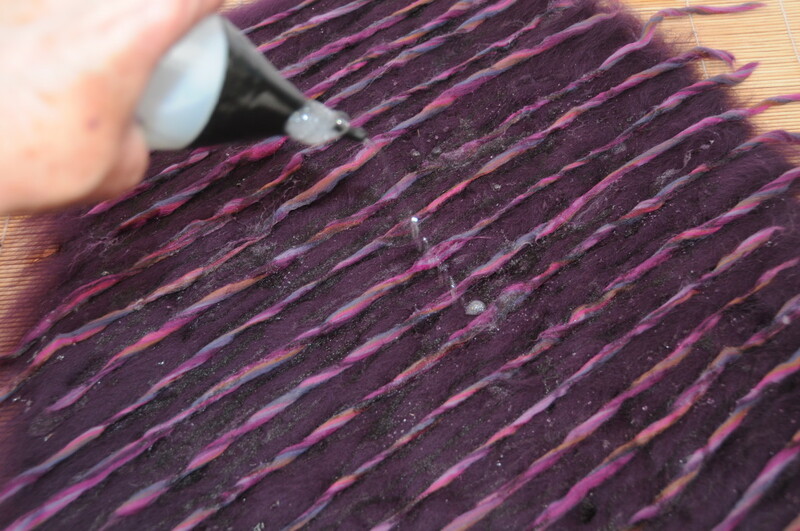 Prepare to neaten the loose fibers on the edges. 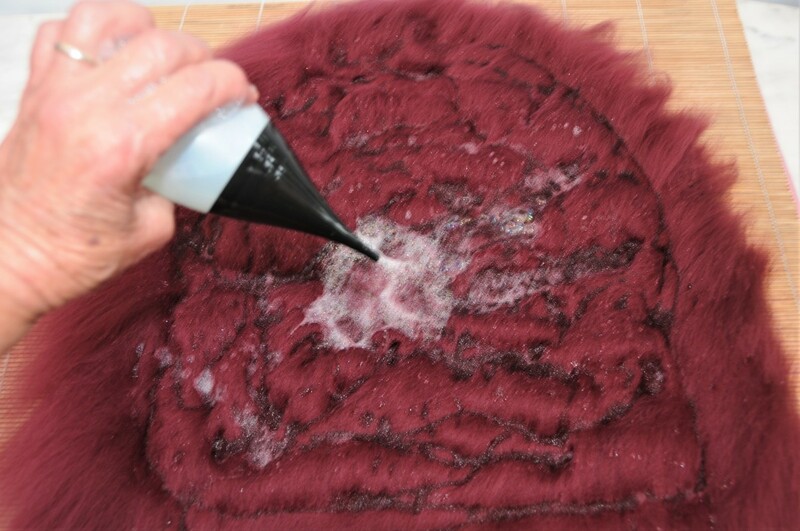 Neaten the edges using a little warm soapy water. 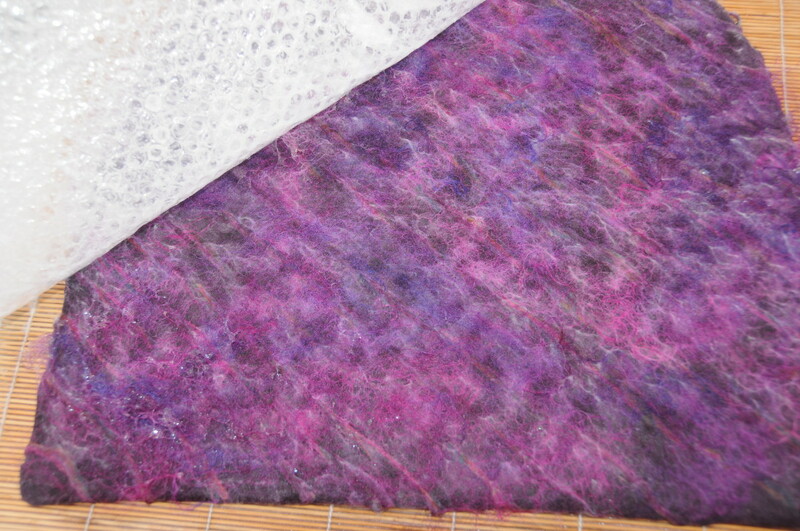 Cover the first side of layer 3 with an even layer of Merino fibers. 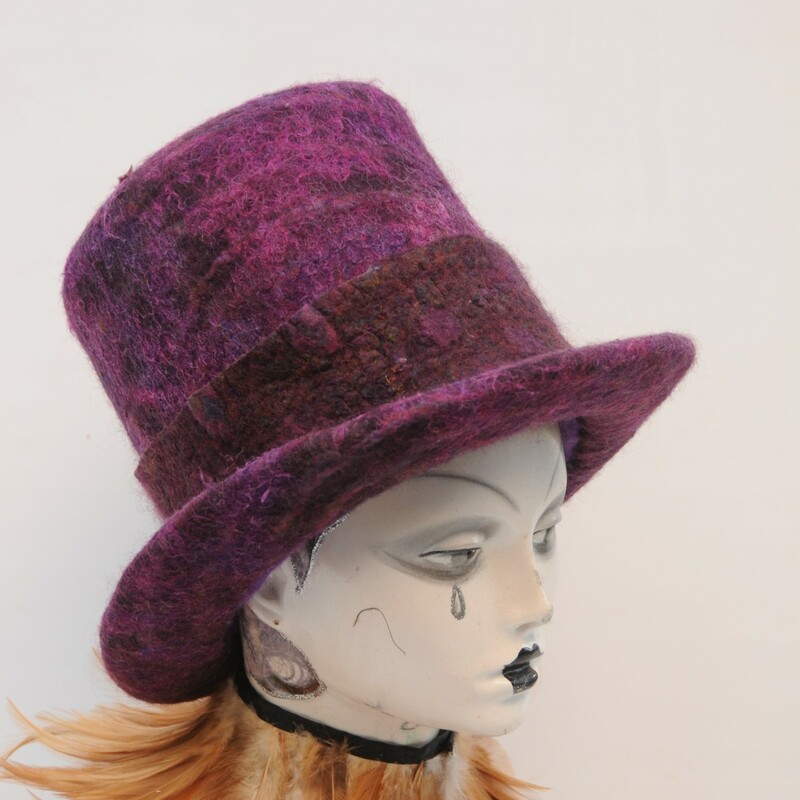 Use pencil roving to create the stripes on the hat. 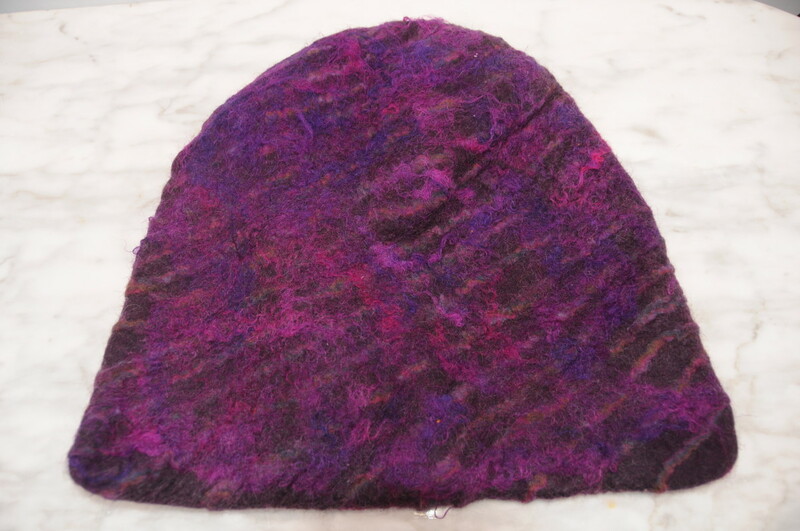 Embellish the surface of the hat as desired or not at all depending on your preference. Wet the stripes without displacing the straight lines. 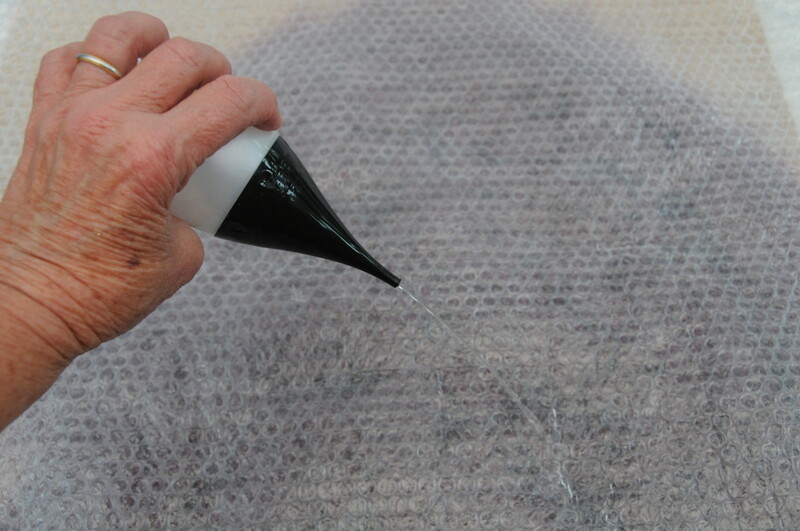 Wet the surface of the bubble wrap and rub as usual but avoid rubbing the pencil roving which extends beyond the edges. 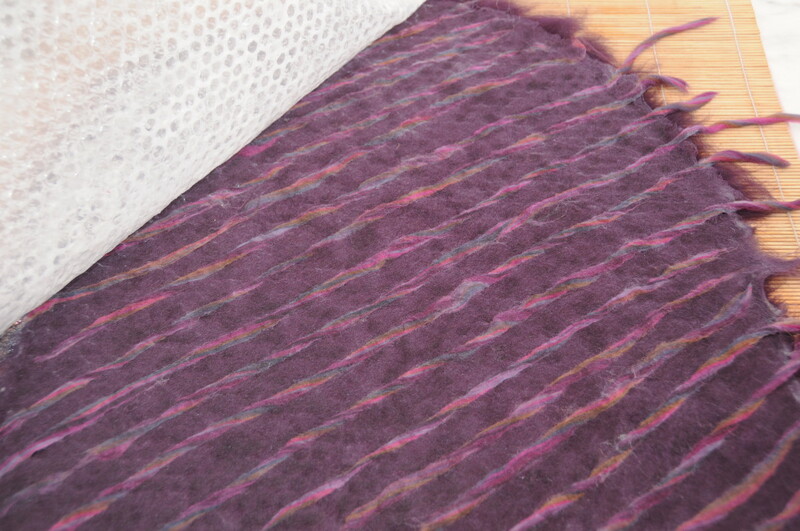 This is so that these fibers can be turned over easily to the other side to create uniform stripes. Lift off the bubble wrap gently so as not to displace the fibers. 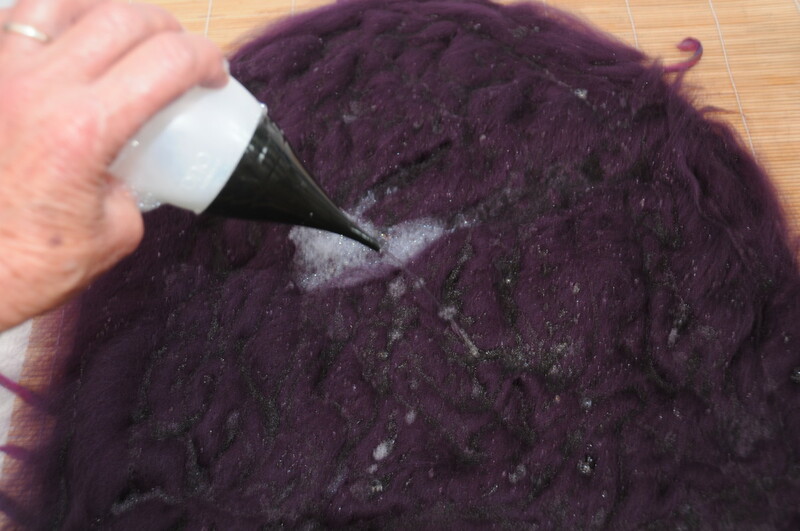 Add a final layer of wool. Don't neaten the edges yet, this is so that the pencil strips can be turned over the edges onto the 2nd side to create a uniform stripes. 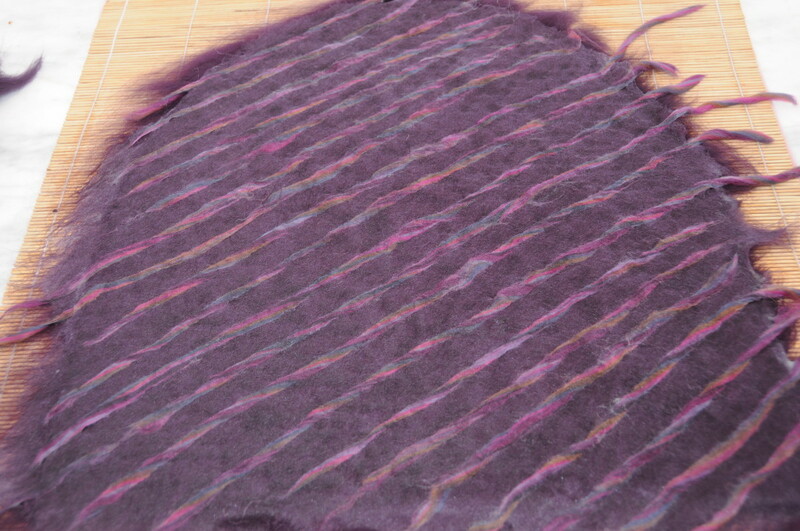 Wet the surface but avoid the loose fibers on the edge and pencil roving. Wet the surface with warm soapy water. 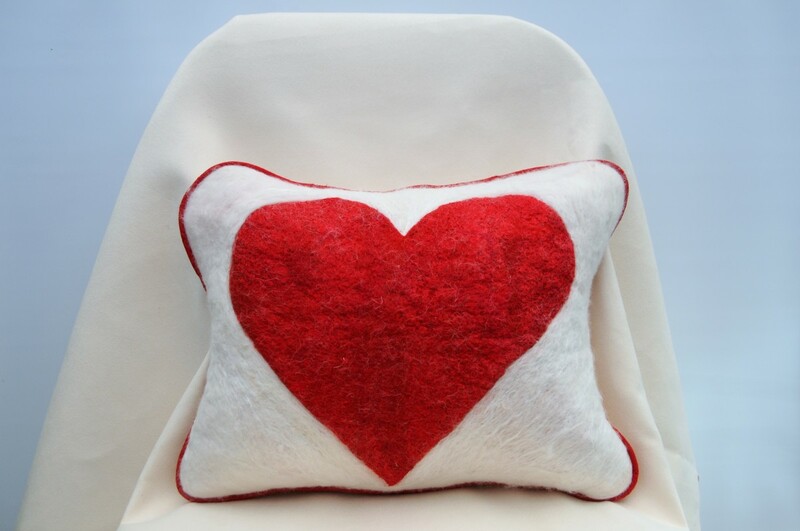 Rub the wool as before but avoid rubbing the edges. 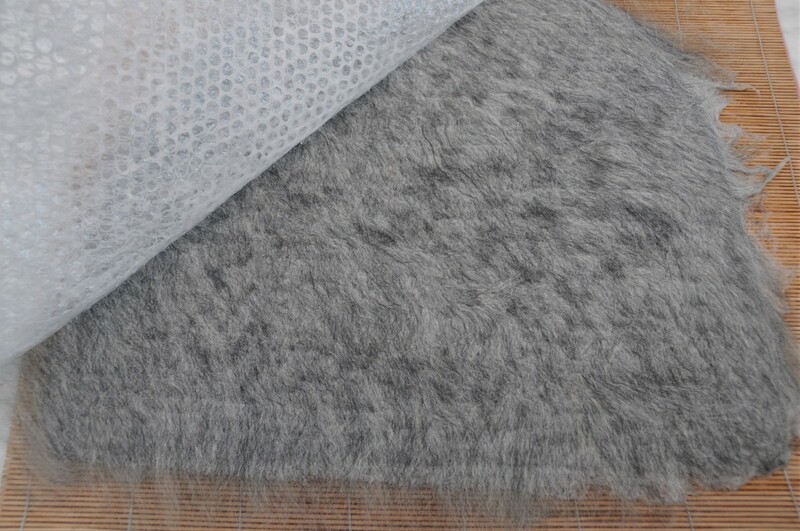 Remove the bubble wrap and prepare to fold the pencil roving and the loose fibers onto the wet wool covered surface. 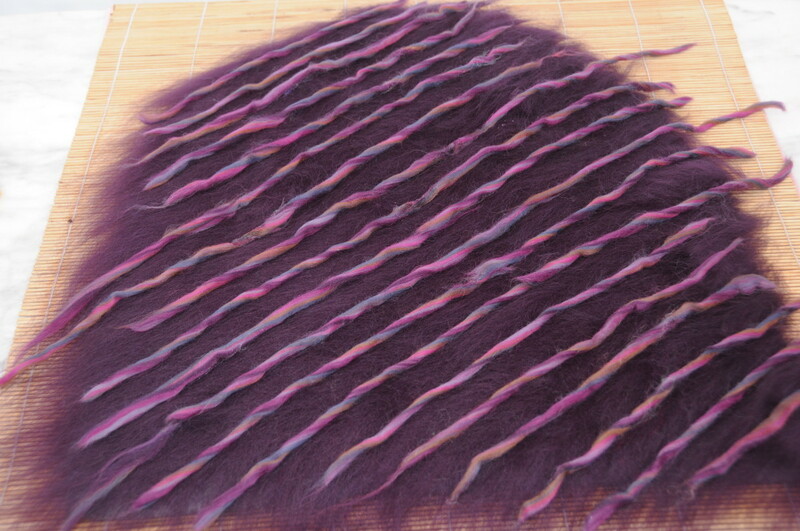 Continue the pencil roving stripes so that they match the other side. 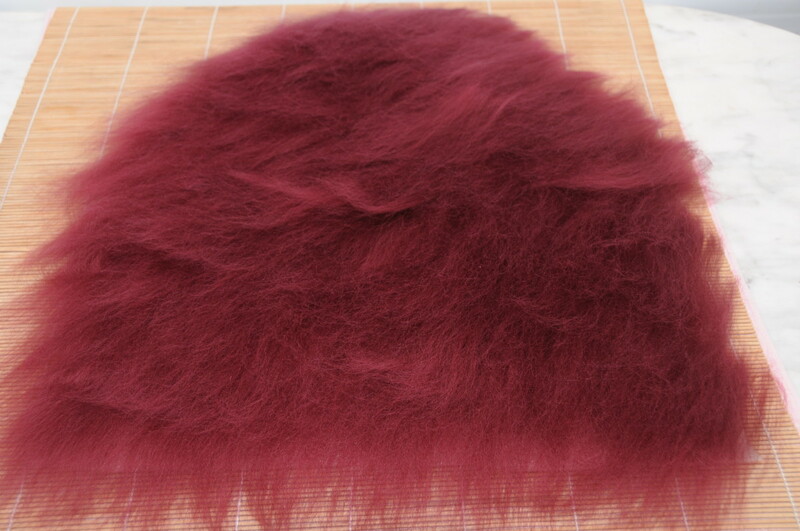 39, 3 Layers are Completed! 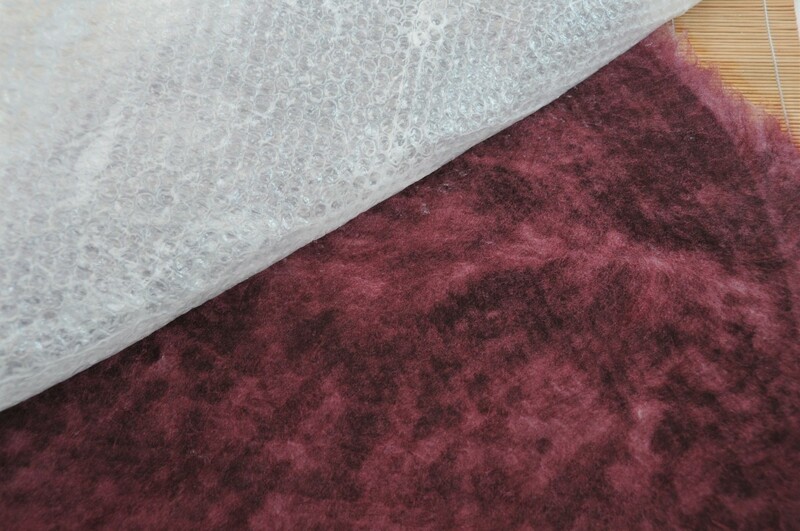 The 3 layers including plus the embellishment are not ready to be Fulled. With the project placed on the Bamboo Blind wet the surface well. There should be a towel placed under the bamboo blind to catch any soap and water. 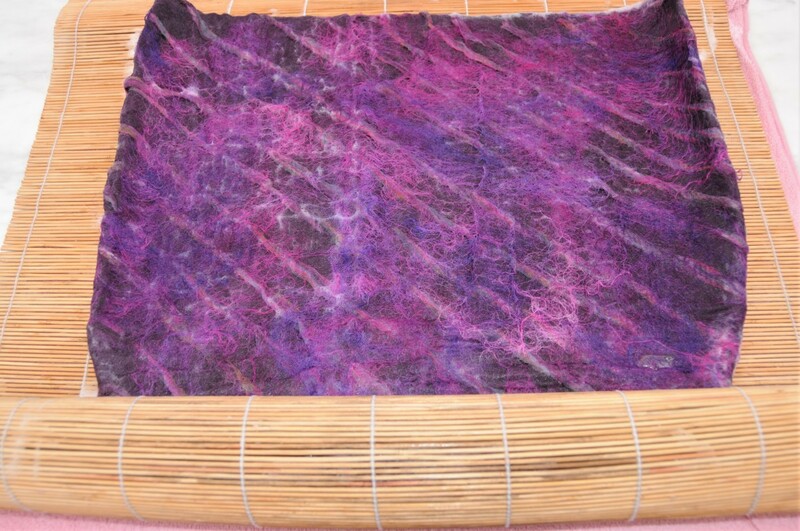 Roll the project about 100 times from all directions inside the bamboo blind. Frequently change the direction in which you roll the project. Roll about 100 times from all sides. Changing the direction allows for even shrinkage from all sides of the project. 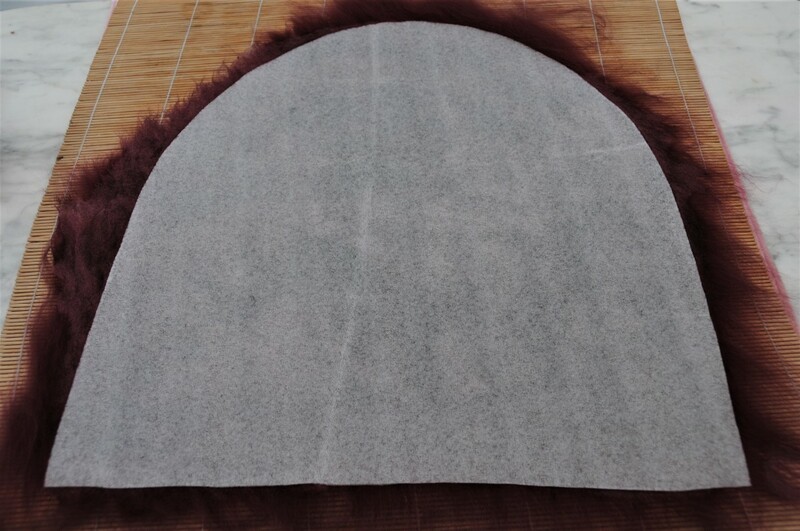 Roll until the sides of the template begin to curl up as can be seen below. 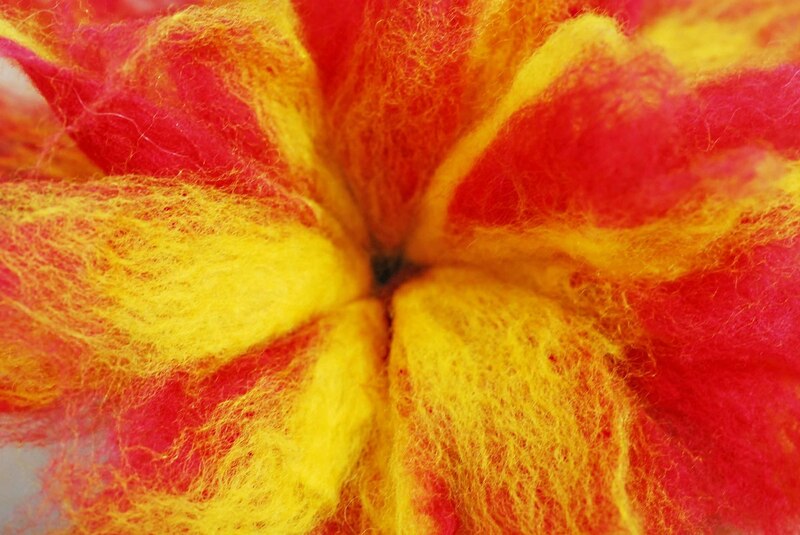 Pinch the fibers between your fingers to see if they move. If they do, continue rubbing or rolling until they no longer move. 44. 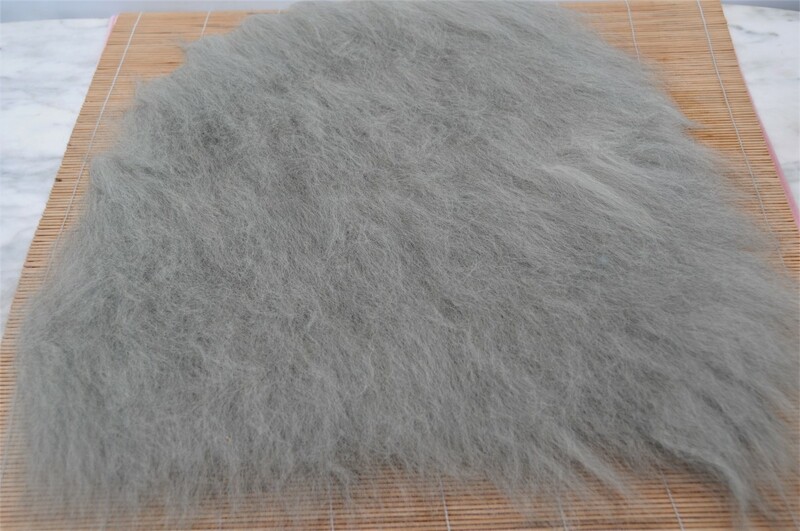 Shrink the Fibers Further! At this stage, I like to put the project into the tumble dryer to save time. You can miss this stage out if you don't have one but I find that it speeds up the process. 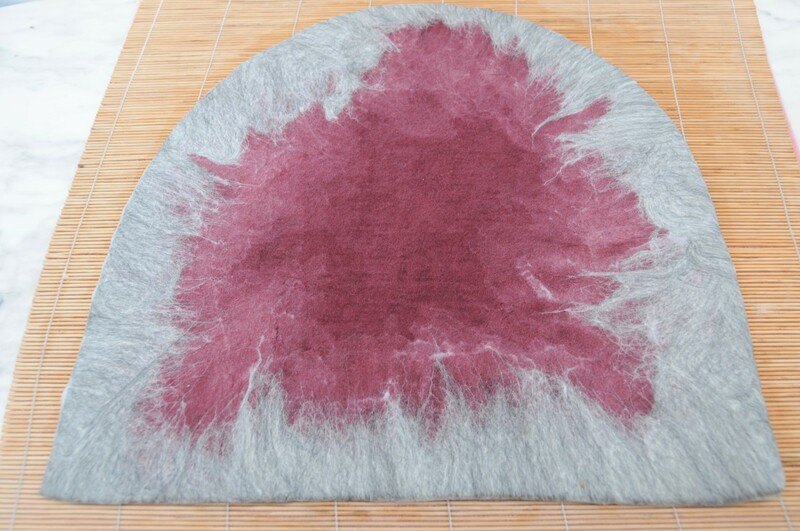 Alternatively, you can remove the template and put the project first under very hot and then cold water. Choose a method which suits you best. After shrinking the project remove the template. 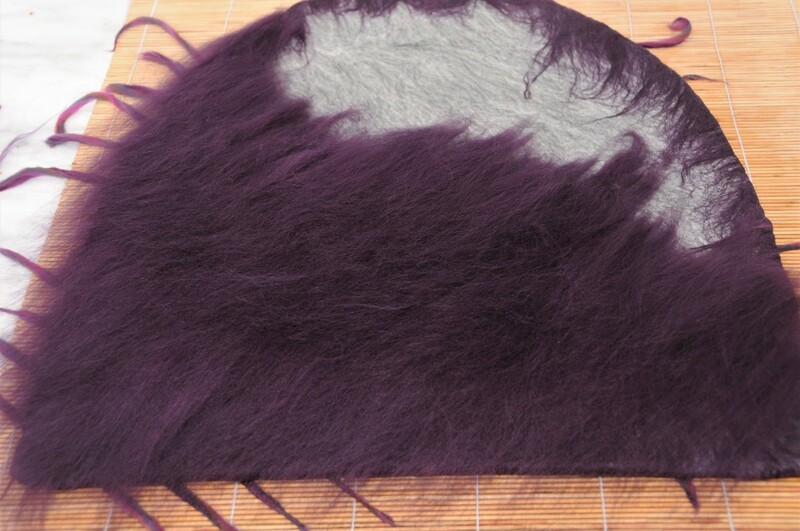 Cut the bottom of the hat open using a sharp pair of scissors. 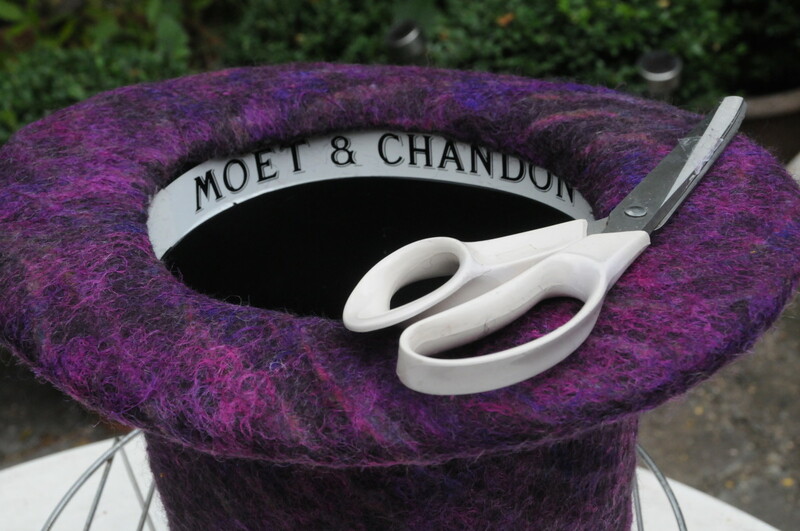 Rinse the project under hot and then cold water until the soap runs clear and then shape the hat on the Moët and Chandon Top-Hat Ice-Bucket. 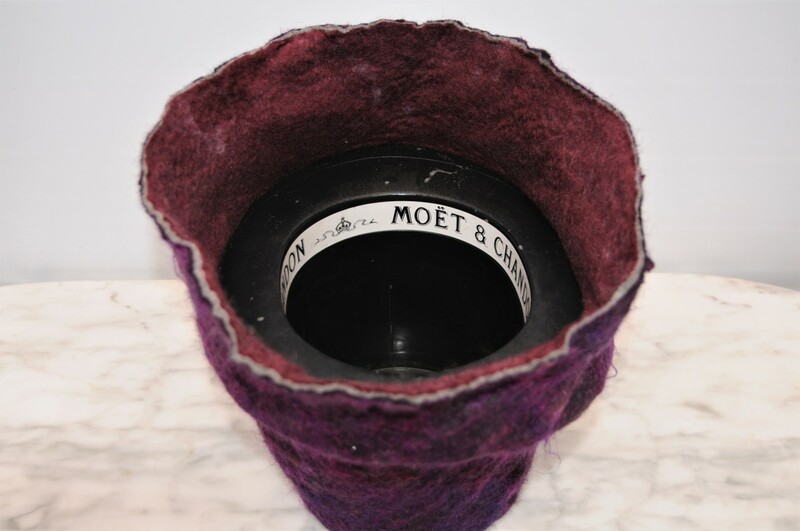 Insert the Moët and Chandon Top-Hat Ice-Bucket into the cavity of the hat cone. 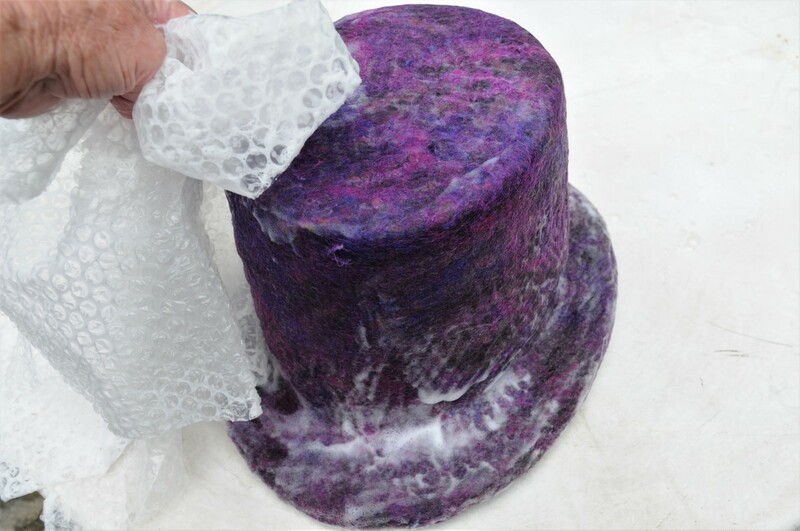 Rub the outside of the 'hat block' using soapy water and a folded piece of bubble wrap, bubbles facing downwards. 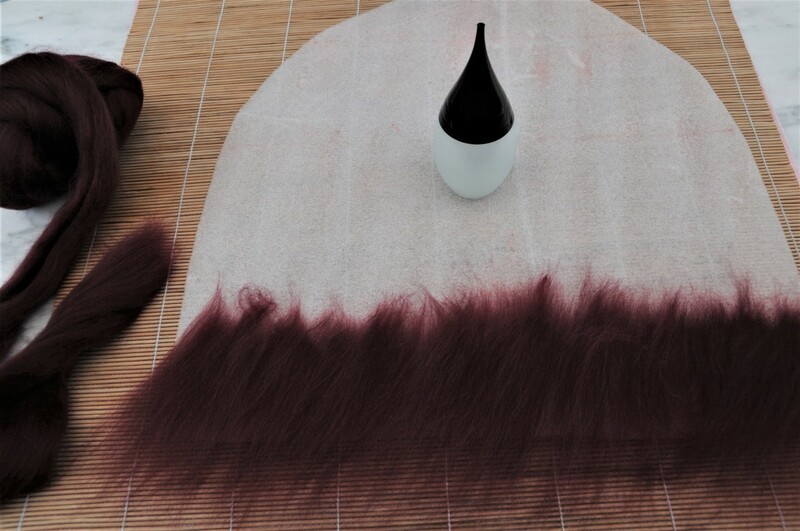 The hat will soon start to take shape as you rub. 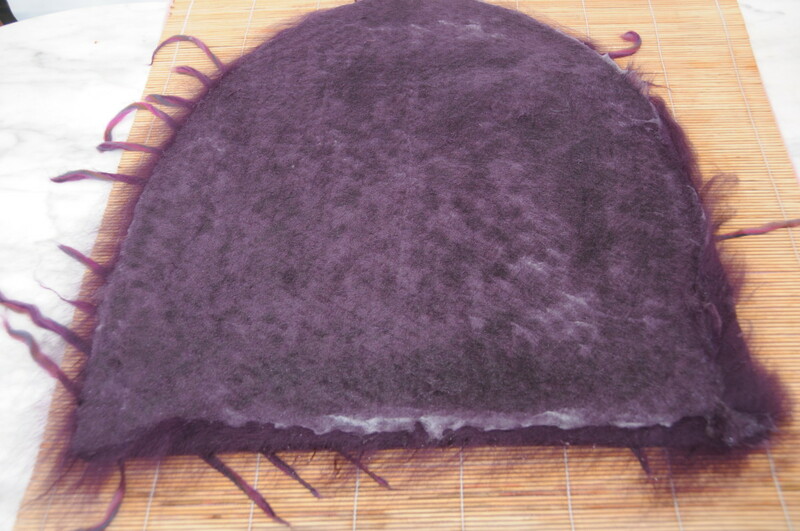 Wrap the excess felt right around the brim of the ice-bucket. Shrink and shape using soapy water and bubble wrap. 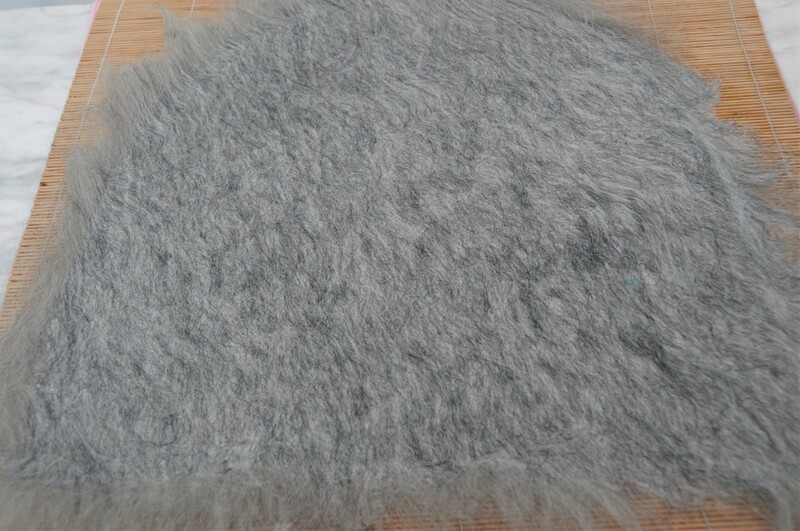 Shrinking and Shaping the hat under hot and cold water. 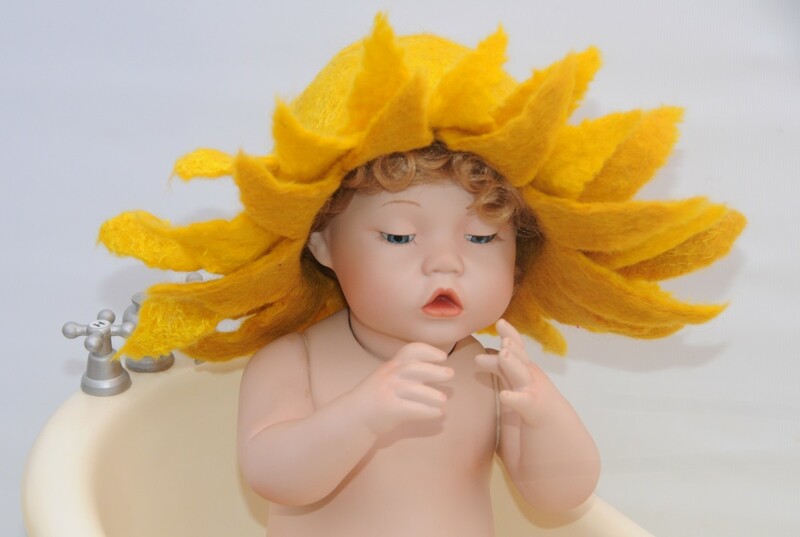 Rinse under hot and cold water until the water runs clear. 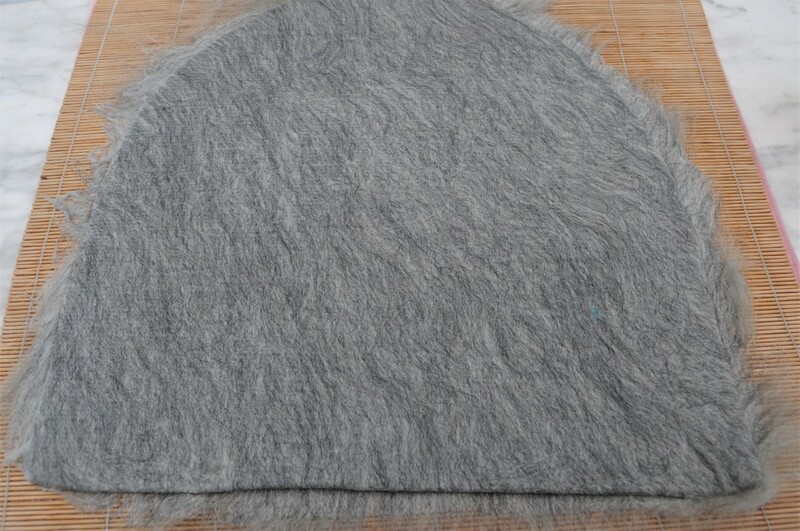 Put an elastic band around the bottom of the hat as shown and allow to the air dry a bit before trimming the bottom edge of the hat. 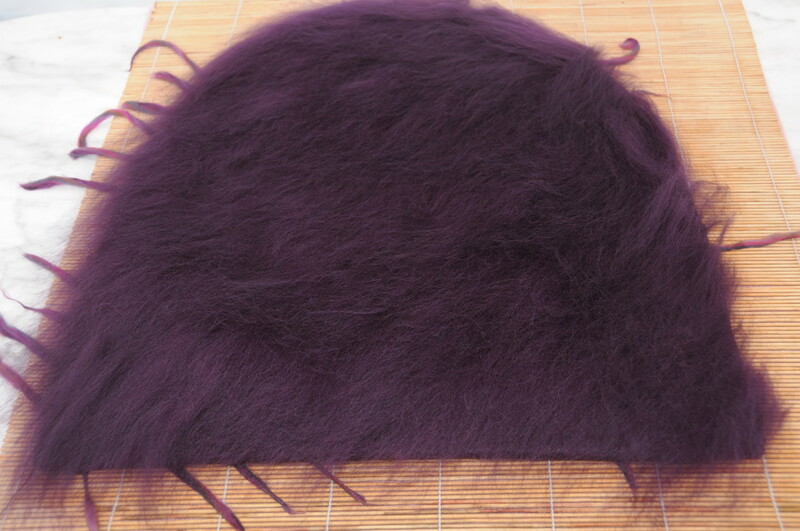 Trim any excess felt which extends into the hat. Carefully remove the Ice-Bucket taking care to retain as much of the shaping which has already taken place. The brim can now be folded double, the bucket returned to the cavity and a final rub of the double brim can take place. 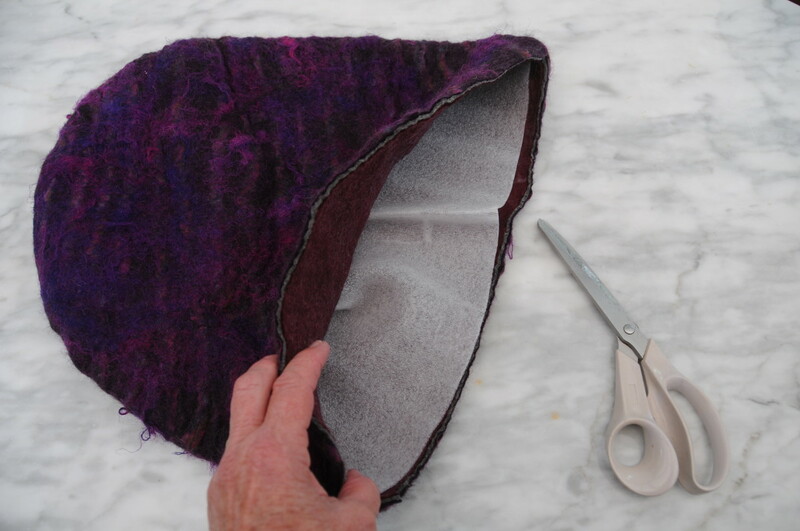 Cut a waste piece of felt left over from a previous project or use a purchased hat band to neaten off the inner edge. 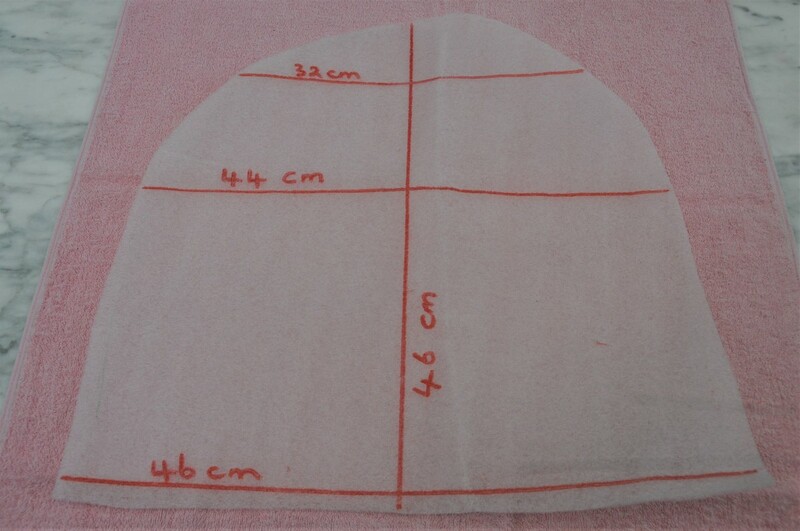 Measure and cut the correct length, join and sew onto the hat band from the wrong side and then it over. Rub well with bubble wrap to remove any sign of the stitches. 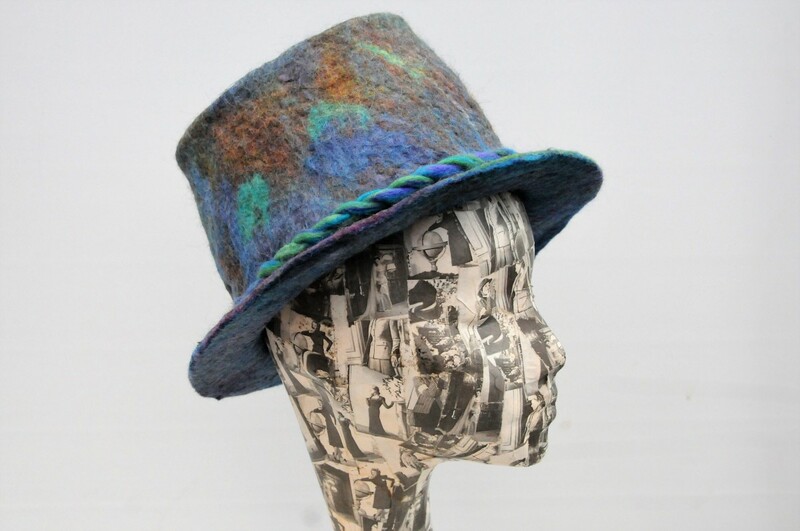 Make a Hat Band which sets off the Top Hat off nicely. 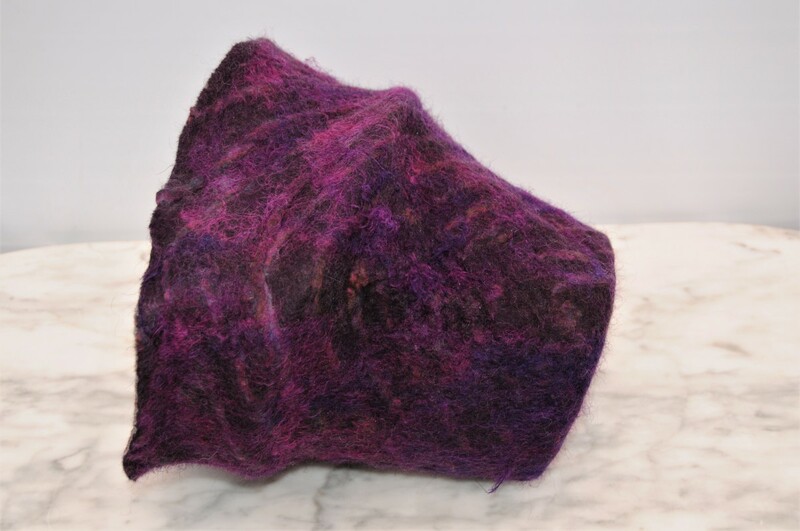 I created a seamless Nuno Felted Band one which I felted in the tumble dryer. Shrink the band until it fits perfectly around the hat. 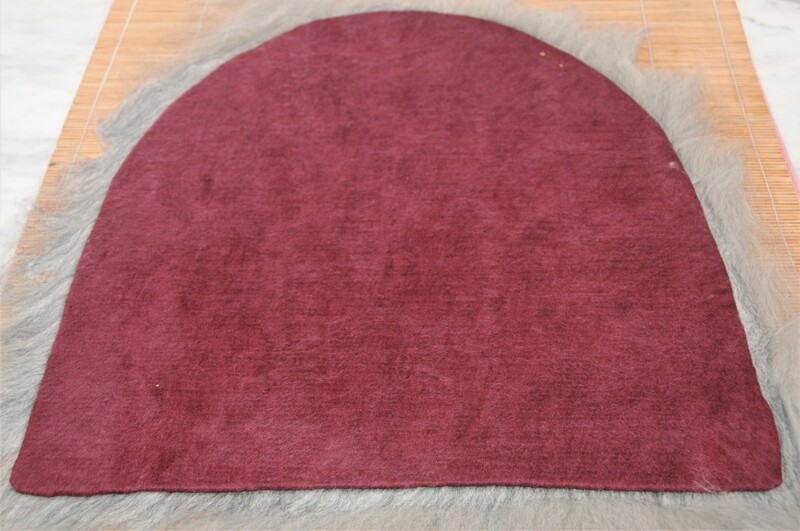 To achieve the right size, start with a band which is about 40% larger than you require and shrink it until it fits nicely around the hat or alternatively you could shrink the band around the head of the person who will eventually wear the hat. Doing it this way give you a little play should the hat be a little too large to begin with. 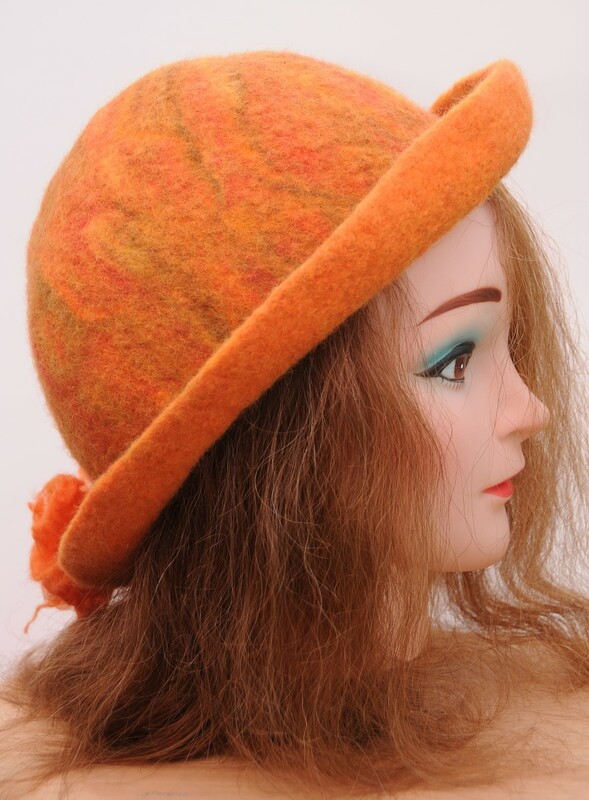 Hi Sally, such a beautiful hat! Your mind works wonders in a creative way and perfectly displayed. Thank you Natalie, I am glad you like this Tutorial. 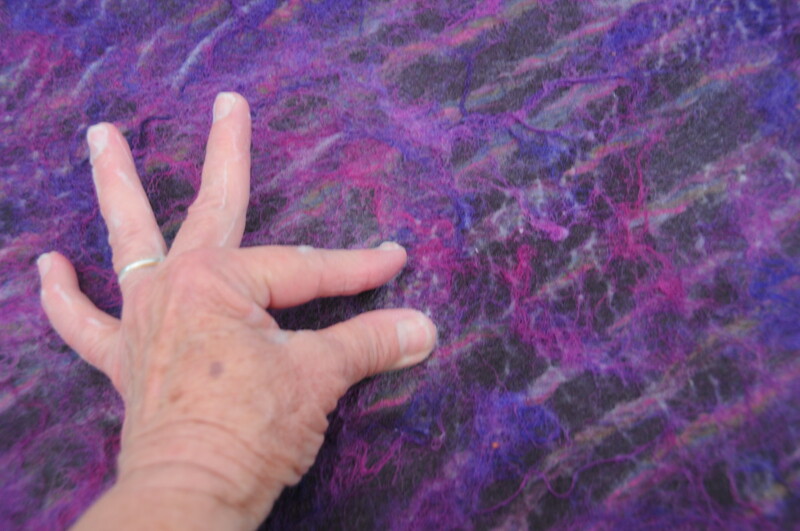 I hope that you find the time to tackle a little felting sometime in the future. Wow! This is an incredibly detailed tutorial. The pictures really add to it. 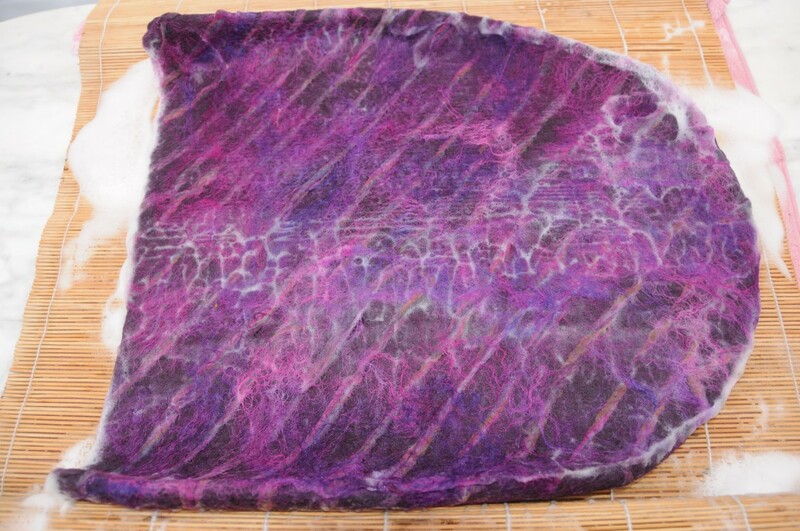 I still haven't attempted any type of wet felting yet but hope to do so sometime in the future. Thanks for another clear set of instructions to an amazing project. It is always a pleasure for me to see your name appear in my mailbox. Thank you, Billy, for taking the time comment on this Tutorial. Your talents on display for all to see...always a welcomed sight, my friend. Glad you like it Mary and I am pleased that you found the pictures easy to follow. 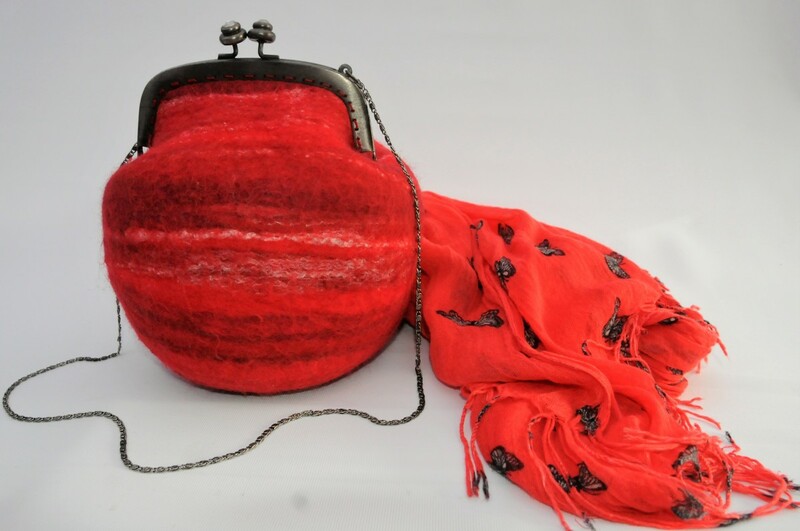 It is definitely a creative project for Winter. This looks amazing and the pictures make the procedure easy to follow. This would be a very creative project for the winter. Super cute, as always! Looks like it would be a neat thing for wearing around the holidays. Cheers! 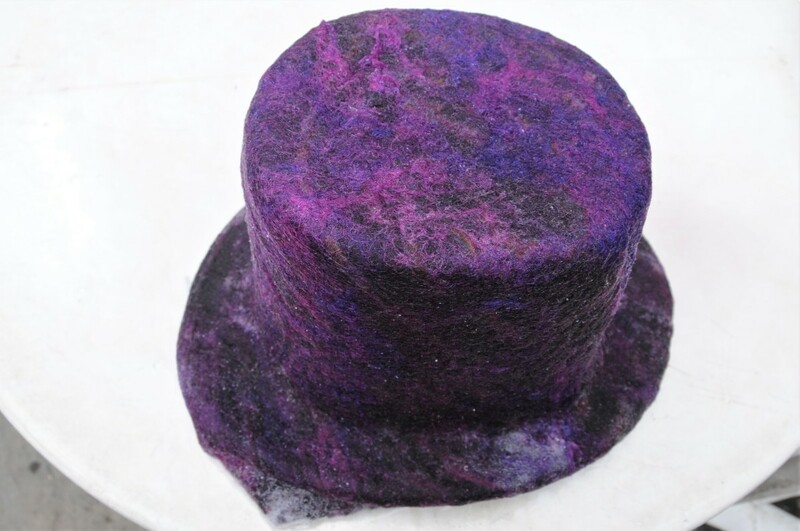 I may never get a chance to make one of these, but that is a really grand-looking top hat! 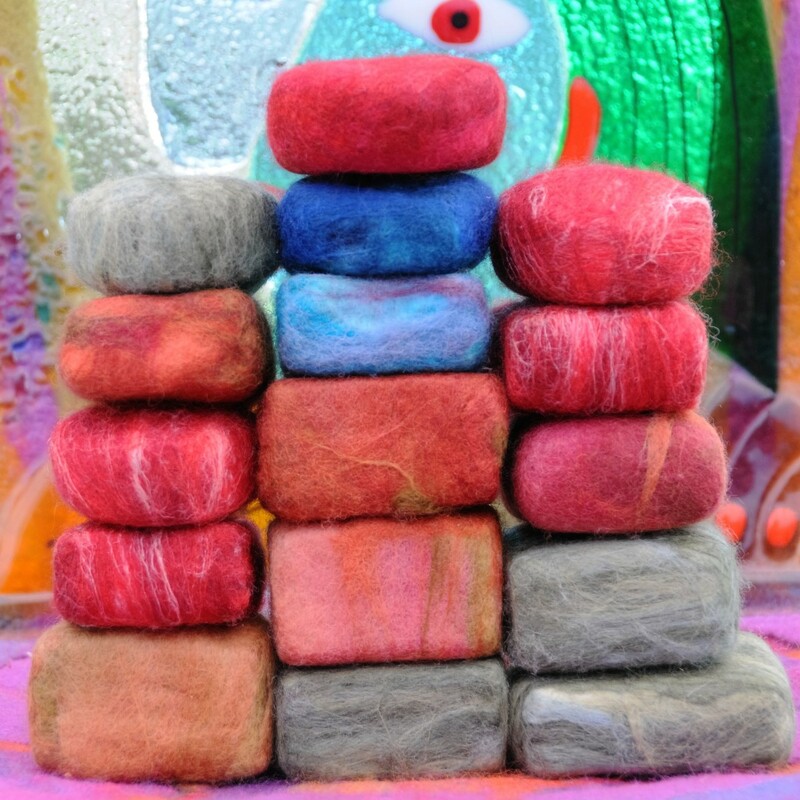 You are a felting genius.